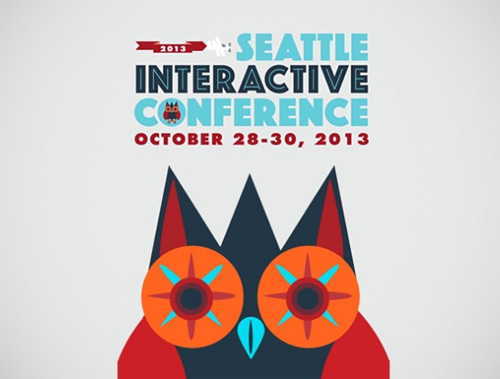 The 2013 Seattle Interactive Conference featured independent viral sensations to seasoned Fortune 50 representatives and much in between. The messages were diverse, but at least one thread emerged to tie many of them together: more people are spending more time outside the web-as-such and inside so-called ‘Super Apps’ – hub spaces like Google, Facebook and so forth. The urbanist in me is reminded of suburban shopping malls: they may look and even feel like public space, but they are not the same thing as the open web and users may wish to remain wary of conflating the two. This goes well beyond the shift away from desktops to mobile devices in its implications, but could also easily be overstated: there will always be ways to stay on the more independent frontiers of the media and technology, too. Mayor Mike McGinn kicked off the conference with a brief introduction on the main stage. From there, your author made the rounds of media-focused presentations but also tried to take in a healthy slug of technology and keynote speakers. What follows is a summary with some opinion mixed in – a condensed version, if you can believe it, of the pages of notes taken by your author, separated into three core sections: Media, Data and Technology. There is not a single unifying thread, but one of my biggest takeaways, alluded to above: large companies are working ever harder to get and keep you in their proprietary ecosystems, buying up competitors, circumventing content producers, stifling or stealing from innovators – whether this is a swing of the proverbial pendulum or the harbinger of an inevitable privatization and partitioning of the open web remains to be seen. Either way, it is good to keep in mind the visions of the industry-shaping giants, whether or not they are destined to take shape. What does it even mean to be ‘in the media’ these days, in a world where BuzzFeed can be called a new organization, and independent journalists focus more on their social media following than in-depth reporting? Are long-form text sites like Medium emerging as a next-wave backlash to the imagification of content and the rise of independent video production? Or is none of this new, with humor in the news dating back to papers like The Onion? Founder of The Onion and, subsequently, The Stranger, Tim Keck gave an engaging history of his involvement in the former but not much information on the latter. His journalist background led him toward starting the Wisconsin paper that would go on to become a sensation, but when he started his main advantage was simply a lack of any alternative newspapers in town. A good and typical example of luck and sweat equity at work. Founding Editor of The Huffington Post, Roy Sekoff, spoke to more current topics, in particular: Social TV and Huffpo Live’s ongoing efforts to create participation and true interactivity. Video comments from watchers can be recorded, reviewed and posted live – think: radio show with visuals. The catch? Their focus is on heart over brain, narrative over statistics – bypassing trusted academics potentially at the expense of integrity. Of Mixpo and TIME, respectively, Jeff Lanctot and Callie Schweitzer had an armchair discussion on the media and audiences. They spoke to the difficulty of replicating the brand power of magazines in digital formats, and speculated about the yet-unrealized potential of local media online. As for monetization: they may be going native, or moving toward real-life events, and adding more lucrative video – the writing on the wall seems ever clearer: display ads in the form of banners are unlikely the way of the future. A diverse publishing panel tackled issues of media, marketing and technology, and featured Chris Grygiel (AP Editor), Brier Dudley (Seattle Times Technology Columnist), John Cook (Geekwire co-founder and technology reporter), Kelly Clay (Forbes Digital Communications Strategies) and Chris Kornelis (writer and journalist). They debated issues of paywalls and pageviews, evergreen content and follower-building across platforms. The differences were perhaps the most interesting: each had their own approaches, preferred media, methods of being contacted and means of marketing – all illustrating there is more than one way promote a cat. New formats were of interest to them, but they also agreed that most were hard to scale and worked only as one-offs … at least for now. As in the conversation with Lanctot and Schweitzer, the question of Pulse and Flipboad came up: everyone seems to agree that these aggregators are a monkey wrench yet to be dealt with. What does it mean for the media, and technologists more broadly, that we are increasingly able to put data in detailed contexts and get realtime reporting on the performance of websites as well as ad creatives? Are we finally going to see a seismic semantic on multiple fronts, from search to advertising? Senior Project Manager at Google AdSense, Sanaz Ahari talked about various data-centric approaches to taking advertising to the next level. In particular, she brought up viewability: it is not just about the fold anymore, but about how long the ad is visible, which is something that was not always (but is now) possible to track. As cross-device compatibility and consumption become more essential and central, so to does this kind of tracking. And it is not just about tracking and reporting back, but about realtime monitoring and optimizing on the fly. Chief Scientist Advisor for Parlay, Dr. Ying Li elaborated on data mining, behavior analysis and scientific methods for testing, validating and iterating results. She emphasized it is not just about the volume of data but about multi-dimensional and connected data – time, opinions, knowledge and, ultimately, closing the loop to get usable feedback on successes and failures in targeting that, in turn, optimize the system for the next cycle. If the first step was untargeted banner ads, the next step contextual ads, and then retargeting, what is the following step? We started with data, then information, then knowledge and now what will wisdom look like? Think: anticipatory marketing. Moz CEO Rand Fishkin spoke to the increasing complexity of Google’s algorithms and the corresponding difficulty of keeping up using only old rules of thumb. Google has gone from using a basic set of mostly-known metrics to a complex web of semantic data that is hard to unravel. To be fair, Fishkin has skin in the game: he wants customers for Moz and reminding SEO folks that they can’t do it on their own is in his interest, too. Still, he made good points, and also made his slideshow available on SlideShare – the only presenter I saw do so. How will new forms of wearable technology shape the next stage in mobile device evolution? And will consolidation of power in the tech industry lead to a few big winners, as we see in other large and long-established industries, or will there always be room for independent upstarts? Or will a backlash of privacy concerns stop this tide in its tracks, with a user-driven shift back toward the more-anonymous origins of the web? Inventor at Intellectual Ventures Lab, Pablos Holman applies hacker approaches to real-world problems. He started with amusing stories about hacking Google traffic data to spell out names (and more usefully: deflect cars from one’s path) but segued into contemporary and pressing issues like: disease spread in developing nations. He explained the spread of diseases in terms of hacking: the point is to find weak points and try to disrupt the system. He also notes that even if a hack, patch or fix is not feasible financially today we can reasonably assume technology will keep getting cheaper; something far-fetched (like a laser-zapping system killing disease-carrying mosquitoes) that could be out of reach today may be cheap to create in bulk and ship globally (or build locally) in just a few short years. A relatively light-hearted Wearables Hackathon drew an eclectic mix of participants and presenters, from individuals to mixed groups of developers and entrepreneurs. Some were about data collection, particularly centered around sports tracking for training feedback (Goal Physics) and safety enhancement (Coach 2.0). On the gaming side, there was a head-bang-powered air guitar hybrid (Hackcouture.io ) using conductive fabric triggers, RFID chip and pebble watch, all connected to wifi, as well as a simple running game (Groove Runner) played on a phone but using only a head-mounted device where tilts determine direction and jumps. Surveillance of Puppies by You (SPY) was entertaining, creative and plausible – a way to track your pet when you are away, facilitated by a combination of a Bluetooth tag on the pet itself and a mobile device carried by your pet’s caretaker. Zachary Smith of Substantial gave a solid presentation on lean and agile development, careful to point out that these are easily misused buzzwords not always backed in practice (they require support at the level of corporate culture and leadership behavior). He worked through a brief history of waterfall approaches to provide a foil for explaining rapid iterative alternatives, collaborative strategies and striving for continuous improvement. Recognizing the limitations of oversimplification, he summed things up as follows: lead by example, empower your teams and encourage experimentation. Learn from mistakes and keep on working. James Whittaker of Microsoft was the one presenter of whom your author asked a question. His vision of ‘superapps’ involves solving intent where it occurs. For instance: you need to know about something someone sent you in an email, you shouldn’t have to open another browser to look it up. The future, as he sees it, is about knowledge in context, not in a void – an extension of the interconnected and anticipatory nature of things like Google Now (not that he used a competitor example). Imagine booking flights from within your calendar superapp – more specifically: having those results surfaced as an overlay within your calendar. The question of creepiness is one he anticipated and attempted to address with Santa Claus – creepy in a good way, goes the argument. Your author, however, remains concerned about associated privacy and security issues, particularly if such a future becomes obligatory rather than optional. He also worries about the implications for his own independent ventures, or other small app makers, but that is a story for another day. SIC Epilogue: Where the Hell is Matt? Your author sat through all three days of the conference from start to finish, seeing almost every keynote speaker and taking a metric (if hyperbolic) ton of notes in the process. He was not the only one worn down as the end approached, but staying around for Matt Harding was worth the wait. He tells a story that is at times amusing and at times profound that starts with him dancing, moves through major corporate sponsorships, and ends … with him dancing some more. In the end, he leveraged funds from a lucrative deal with VISA to travel to and dance in all of the countries that he was explicitly forbidden from dancing in while under contract. In short: he turned a chance viral sensation into a sustainable revenue source, then in turn turned that into something even more powerful – a message about how even the most dangerous and taboo places on the planet have friendly people who will engage with a stranger in their strange land. He tells a great story, and you should watch his videos, too.